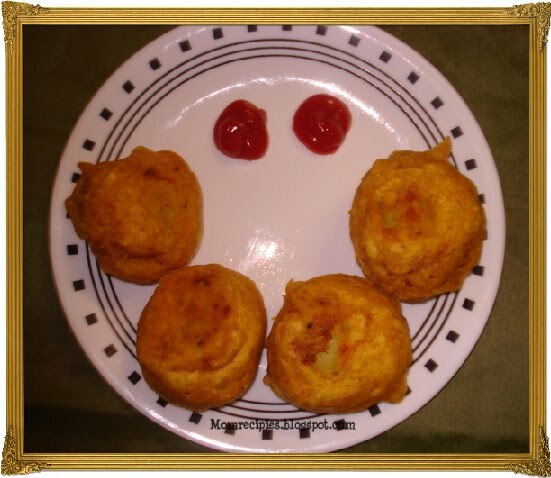 Batata Vada, is a deep fried indulgence. It is Mumbai’s popular Street food .In south it is called Aloo Bonda.There are a lot of variations in making the potato stuffing. It is simple to make and delicious to eat.Here is the way I make it. Heat a little oil in a pan and add mustard, cumin seeds. When it starts popping, add curry leaves, green chilies paste, ginger garlic paste, onions and fry till onions turn translucent. Add the mashed potatoes, turmeric, salt , Asafetida and mix well. Cover with lid and cook for 5 ins. Add chopped coriander leaves and mix. Let it cool a bit. Mix all the above ingredients with water to make a smooth paste. As soon as water it added to the flours, it starts becoming lumps, so mix it with hand to remove lumps. Do not make it too thin, otherwise the coating does not hold on to the stuffing if it is too thin. Heat oil in a pan for deep frying.Make a small ball from the stuffing. Dip the ball into the batter and deep fry in hot oil till it gets slight golden brown colour.. Then Take it out on a paper towel. Serve hot with Tomato ketchup or Green chutney or Tamarind Chutney.